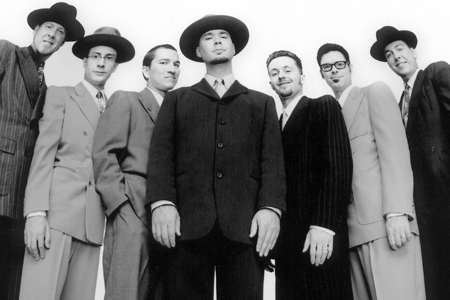 2018 marks the 25th Anniversary of Big Bad Voodoo Daddy’s remarkable arrival on the music scene. In their early years, having secured their legendary residency at the Derby nightclub in Los Angeles, they reminded the world—in the middle of the grunge era, no less—that it was still cool to swing, big band style. Skyrocketing to fame after their appearance in the classic movie, Swingers, the high-energy nine-piece ensemble continues the party with their notable hit singles including ‘Go Daddy-O’, ‘You & Me & the Bottle Makes 3 Tonight’, ‘Mambo Swing’ and ‘I Wanna Be Like You.’ In addition, Big Bad Voodoo Daddy has played the Super Bowl, as well as numerous Pops programs of American symphony orchestras, including the Los Angeles Philharmonic, the San Francisco Symphony, and the Atlanta Symphony Orchestra. If you want to have fun, Big Bad Voodoo Daddy is there, ready with serviceable, pumped-up swing – music is straight, uptempo, dance floor jazz.